Dear Readers, please give Rachel some advice! We are looking forward to your ideas! This week I am sharing Rachel’s dilemma. 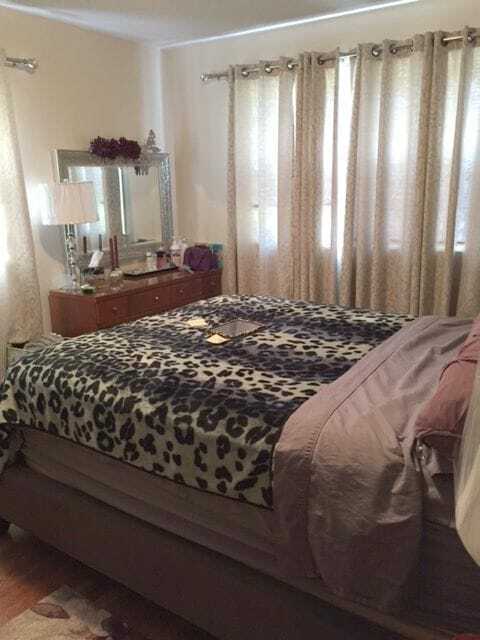 Rachel contacted me through the blog regarding her bedroom set. It was originally her mother-in-laws and has great bones but a very dated finish. She is giving her bedroom a makeover and is wondering what direction she should take. Rachel’s husband is a Marine and they move frequently. She needs a quick, easy update. 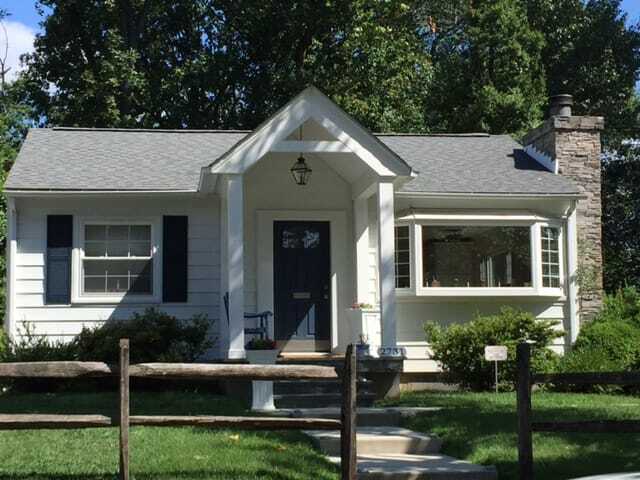 After chatting on the phone, we discovered that Rachel lives literally around the corner from the very first house Bob and I bought after getting married. Small world! I drove over to meet Rachel and have a look at the room and furniture. Here is the set. The standard, 60’s vibe. Here is the new headboard she just purchased, which is awesome. 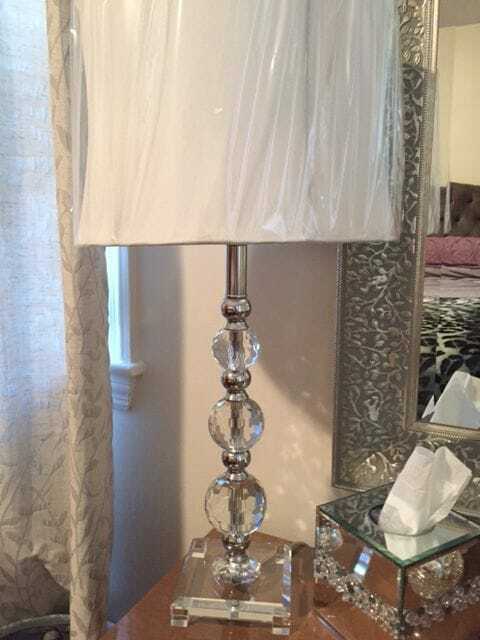 Her new lamps, mirror, drapes, hardware and headboard makes me think that she definitely likes the Hollywood Glam look. I think that General Finishes milk paint will look great on the bedroom set and give it a modern update. New glass pulls will play off her new lamps really well. I am thinking either Snow White or Lamp Black to give the glam vibe. I would also paint the walls in a pale gray (one that has a purple/blue base) and add new bedding and pillows that incorporate her love of purple. Remember her husband is a Marine – not too frou-frou! What do YOU think? Comment below! Rachel and I are looking forward to your ideas! Do you have a design question to share on the blog? Shoot me an email and some pics to share! In case you were wondering, yes I drove by our first house to take a peek! I couldn’t help myself. It has been 17 years since we lived there…memories! Filed Under: General Finishes Milk Paint, Vintage Dresser, What Would YOU Do? 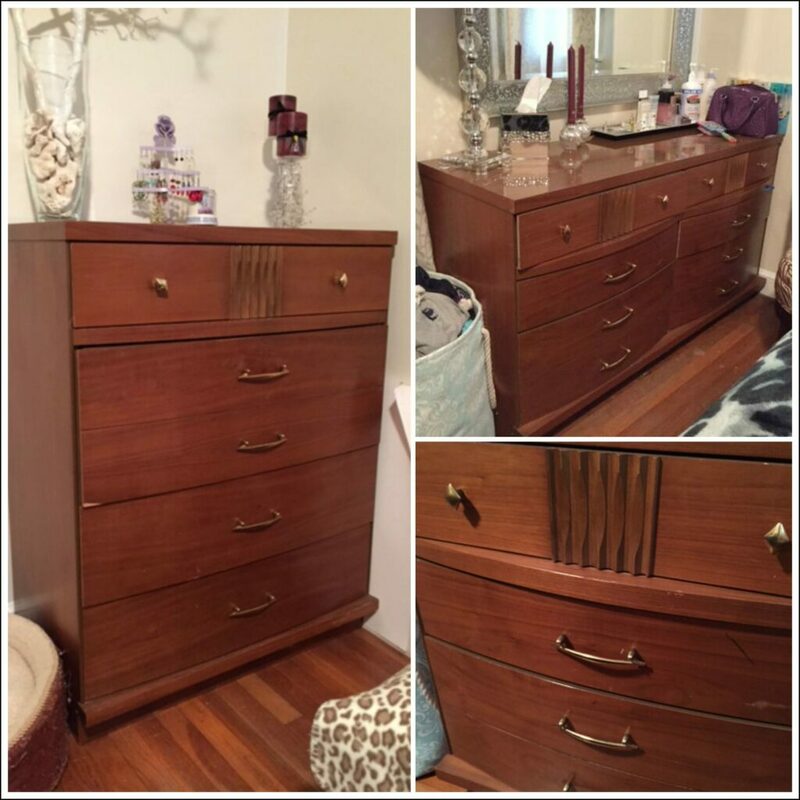 Tagged With: 60's Bedroom Set, Rachel's Room, Vintage Dresser, What Would YOU Do? Wondering if Rachel would like to do an ombre effect ( top to bottom) in shades of palest gray to charcoal on those 60’s dresser drawers……..Would look great with those glass lamps and glass knobs/handles! Love this idea but she is a novice painter (first time ever painting furniture!). However, such a smart idea – love it! I love all of your suggestions – will definitely give her the glam look. 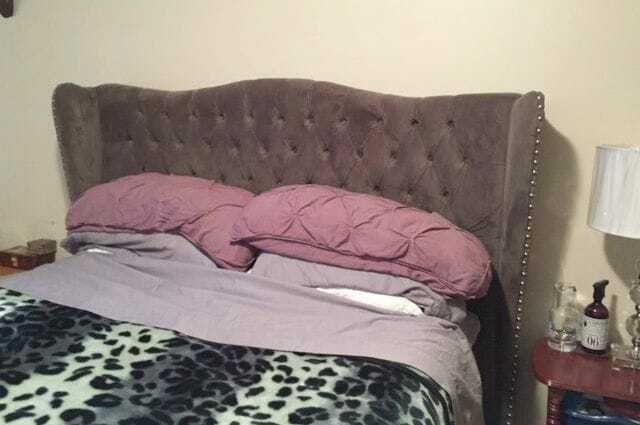 I would keep the bedding neutral, either white or a pale gray with a white design, and use her love of purple only as an accent, say with pillows, picture frames, baskets, etc. I found out the hard way that using too much of an accent color can drastically reduce the soothing, calm feel of a bedroom. Adding a bit of silver paint to a medium to gray paint would give the furniture a Hollywood Glam feel. I love the lamps! A soft color on the bedding would look wonderful! I am wondering about your comment about milk paint looking modern? I have never tried GF milk paint, but I have used several brands of milk paint, and I don’t think they work in a modern setting. I usually paint with milk or chalk paint, but I have a piece that needs a more modern finish, so I just bought Fusion. I have no idea what the finish is like yet, but I will know by tomorrow. I was going to say that her room is too small for a lot of black furniture, but I know how much men like black. I think all white might be too feminine. If she wants white, she could put a very dark stain on the top surfaces. I love the idea of a subtle purple-undertone gray for the walls. I would go bright white on the bedding. Love the idea of white bedding but she has pets (should have mentioned that fact) so not sure? General Finishes milk paint is acrylic based and has a great sheen to it. Totally different to chalk paint or MMS milk paint that I feel lends itself to the more old European or cottage vibe. You should give it a try – it’s an awesome product. love it on more modern pieces. I I have yet to try the Fusion. I should get some and give it a whirl! Thanks! Since she already has light walls with dark furniture the opposite (white furniture with gray on the walls) would be a nice change. But all white may be too much and all black may be too heavy for that small room. What about one piece white and the other black or the nightstands in the opposite color. Definitely raise the rods. And hang the mirror on the wall. It looks like it’s attached to the dresser Plush white bedding for sure! Great idea on the mirror! I think she should keep the dresser/chest the same color but do a different color on the nightstands – maybe add a punch of color? The curtains are new so she can’t move the rods up – once the walls are painted I’m sure they will look great. Suzanne, as of this moment, two coats in, I am not liking the Fusion. I may work it out, but right now I am pulling my hair out. It seems to have a learning curve. I was thinking the same thing with the curtains. I noticed while there that they are not hung high enough but she just bought them. I think they are great and once the walls are painted, they will look even better. No point in spending more money on curtains when she only just purchased these pretty ones. I think black is too heavy for the small room (but I love GF Lamp Black!) Maybe Snow White for the dressers. I love the grey walls with purple undertone idea. I can’t tell what color the curtains are – I’d hate for the white to clash with the curtains. I would paint the room a light grey, use off white for the dressers and definitely all white linen for the bed. Good luck on your project and please post pictures once you are done! I would go totally glam on the furniture and spray it a silver — not with a can, but with a proper sprayer for a chic, elegant look. There are so many awesome metallic colors out there, and soldiers wear a lot of metal, right?! Experiment and have fun!. If the first picture is how the room looks when you enter it, I would definitely move the bed to under the window. You should never see the side of a bed when you enter the room. If that is the case, I would put some cool blinds in the window with just stationary fabric panels on the sides in a great fabric to compliment the awesome headboard. I would move one of the pieces of furniture out – looks way too crowded. And yes, some sleek, silver paint on the furniture with crystal knobs. a very light grey on the walls. Neutral duvet on the bed with pattern on pillows.